Congratulations to all students on their fantastic performances at our 2015 Winter Concert, held at Jazz Music Institute! I was thrilled to see the growing confidence of all performers, and the increasing musicality shown across the performances. I am especially proud of my youngest students for whom this was their first concert experience – you all did such a wonderful job! I also loved hearing students performing duets together this year, it’s tricky to schedule joint practice time for these to occur, but they help develop great skills in listening and timing, and are so motivating to practice. I look forward to teaching more student-student duets in the future. 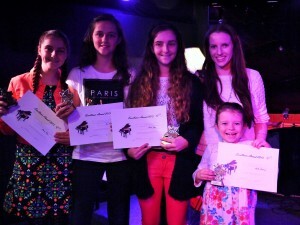 Special congratulations to our Excellence Awards winners for the first semester; Lucia, Sienna, Evie and Halle. Your awards are a result of your consistent hard work both in lessons and in practice, your willingness to listen and learn, and your constant enthusiasm. You are all exceptional young musicians and I feel privileged to be your teacher. Keep up the great work! This entry was posted in Uncategorized on July 15, 2015 by Thembi.